The face generator is a web app that assembles faces from various elements, generating a wide variety of faces. It supports multiple artists! 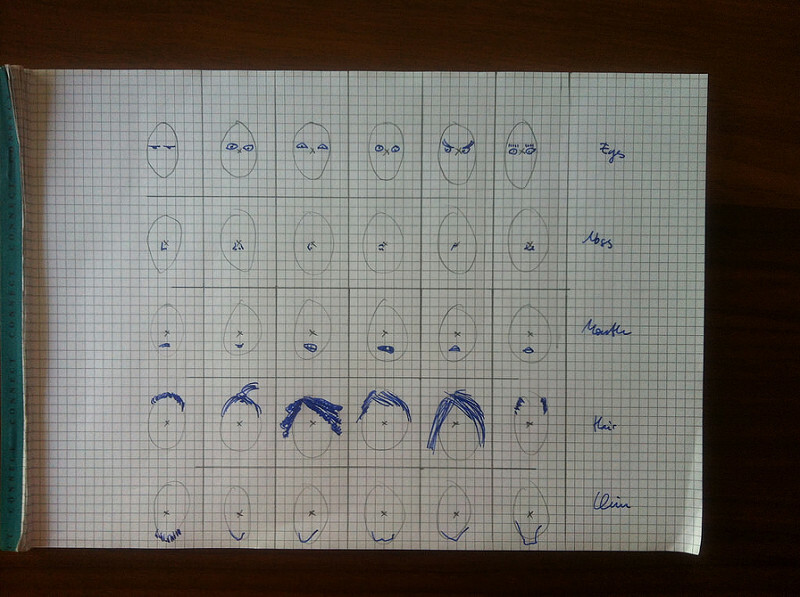 Here’s how to create a new collection for the face generator. 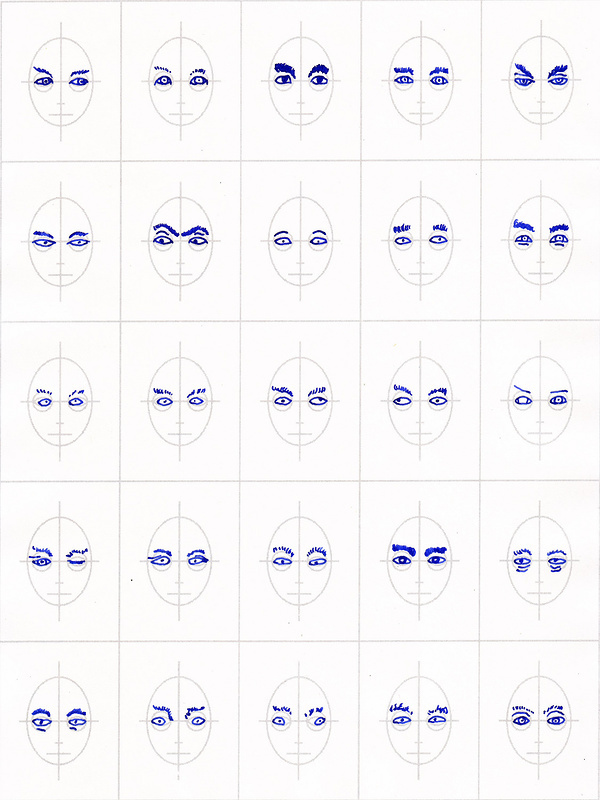 Second, get a pen and start drawing a sheet of eyes, of eyebrows, of noses, of mouths, of ears, of hair, of chins. Scan them. I use Gimp and there the File → Create → XSane → Device dialog... menu opens the scanner application. There, I pick Gray and 300 DPI. Then I scan all the stuff I drew. Next, in Gimp, the processing begins. The first problem is that either the printer or the scanner don’t really get straight lines. Use the rotate tool to rotate the image until it looks as straight as possible (shortcut Shift+R). Move the window edges around until you have the opportunity to check whether the lines are in fact straight. In the screenshot below I’m looking at the left edge to verify that the rotation is good. Use the crop tool to cut off anything outside the template (shortcut Shift+C). Got to Image → Scale Image.... Scale it to 2250×3000, breaking the link between width and height. Got to Colors → Levels. In the top bar, move the tiny white triangle to the left until the template is no longer visible in the image. Click the black pipette and then click onto a line that you have drawn such that all your lines are now pitch black. Export your image (shortcut Ctrl+Shift+E). Cut the image into elements using cutter.pl. It cuts the scan into 5 × 5 images of 450 × 600 pixels each and labels them by row. You’d invoke it as follows: perl helpers/cutter.pl source1.png alex eyes_all nose_all mouth_all hair_all chin_all or perl helpers/cutter.pl source2.png alex eyes_all nose_all mouth_all hair_all ears_all. 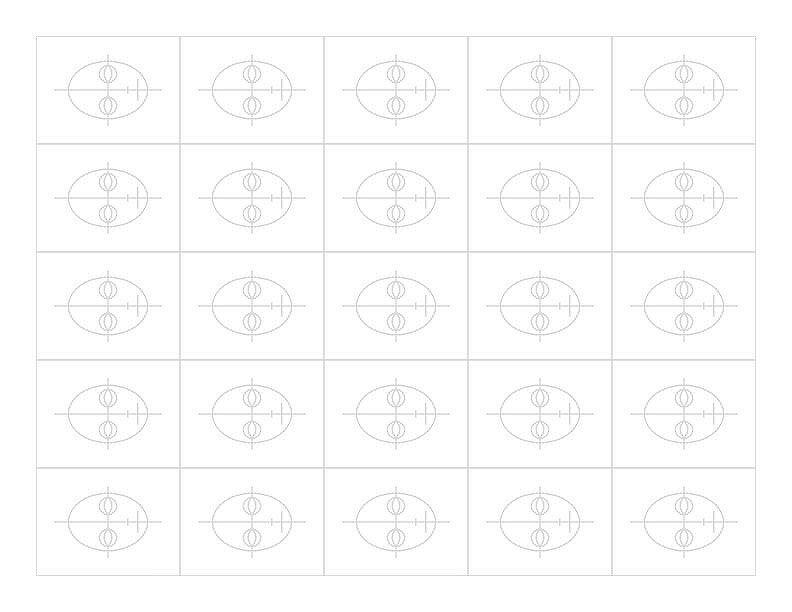 In other words: First is the source image, then the artist name, and then you provide the element for every row. If the remaining rows are all the same element, you don’t need to repeat it. 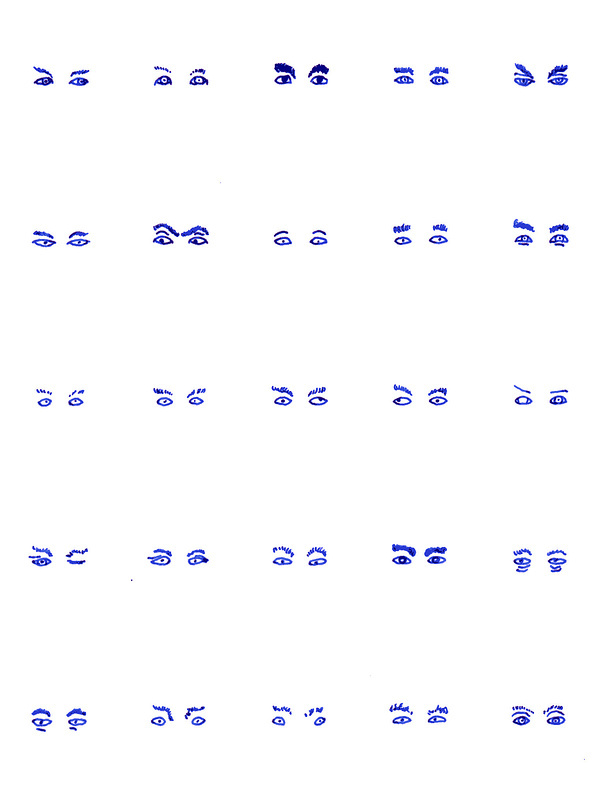 Thus, if you’ve drawn a sheet full of eyes, just use perl helpers/cutter.pl source4.png alex eyes_all and you’re good. Make sure you use _all in the filename. 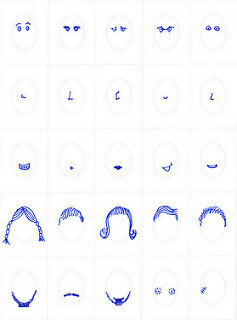 That’s how the system knows the face element can be used for all types of faces. A few days ago I started wondering whether there was an efficient way to draw new face elements for my face generator on a tablet. I used the iPad, the Apple Pencil, and Procreate, started a new image based on the empty grid I always use, used a separate layer for every kind of element (one layer each for eyes, nose, ears, mouth, chin, hair, and extra), exported the image as a PSD file, used ImageMagick to get at the separate PNG layers, split the PNG layers into the various tiles, made sure the naming conventions were good to go, and here we are. A few things to note: no effort at categorisation was made. For now, the generator mixes all the elements even if later the long ears will be used for elves only, for example. It’s just a first stab at things. I also feel that there ought to be no gender differences as far as eyes or mouth are concerned because I’m assuming no makeup (or equal use of makeup, I guess). I’d like to see how far I can get with sticking to just the chin and baldness as far as sexual dimorphism goes. I think it might work even though we’re pretty used to makeup and hairdo these days. Anyway, this is the first time I’m seeing some random faces assembled from my PSD file. The proportions still seem to be off. What’s wrong with these heads. Too small, too round? Need more hair? Men need stronger jaws? Something is still wrong. Feel free to use my template and give it a try! If you do it, I’d love to get your PSD file to add to the web app. And I’m hoping you’re as willing as I am to dedicate it to the public domain. That makes it easier for everybody else to just use the generated faces for their character sheets, booklets, or whatever they’re doing. 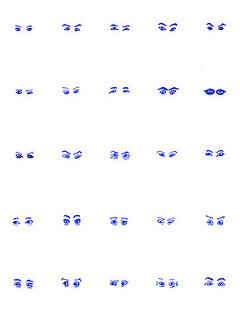 The Face Generator now generates squid faces, a.k.a. mindflayers... For those of you needing a squid face or two. And as always, the faces generated are dedicated to the public domain. I ran out of ink half way through drawing the elements and since I try to always wash the fountain pen as I change cartridges, the tentacles turned out very light. I tried to correct it in The Gimp but it isn’t perfect. I discovered that my layout of facial features was sloppy. There’s a big white area where a human nose would be, but I can’t put a nose there. I can’t move the tentacles up because the jaw lines and the lower eye ridges will interfere. Gah! More planning, less enthusiasm, next time. I’m not sure whether I’m going to spend more time fixing squid faces. I don’t expect to use them all that often. If you find that you really, really need then, contact me and we’ll talk about it. Hope springs eternal, after all. The Face Generator gets a new artist! 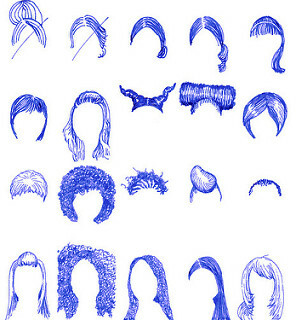 And it reminded me that I can just keep adding to my own folder and so I added 25 more hair elements for women to my folder. The face generator keeps growing on me. I’m super happy with my dwarven faces! I’d like to generate random faces, quickly. I’d draw them myself if I had any talent and a wider range of faces I knew how to draw. Sadly, I’m not that good. So here’s the idea: draw a bunch of eyes, noses, mouths, hairs (or hats? ), ears, whatever it takes. Assemble at random. If we want to get fancy, we can tag those elements (male, female, elf, dwarf, halfling) to get better faces but perhaps we can do without. But then again, if you’re going to volunteer, then you set the rules. I’ll do the cleaning up, extracting, coding, hosting, whatever it takes to makes this real. I’d want to use an open license so that other people can build on it in case we drop off the Internet one day. The elements I already have are also online, of course. Source code is also available. All I’m missing is the artwork. Once we have the artwork, I’ll add more features to the web app. Most importantly, we’d want to redirect random faces to an URL that encodes the elements used such that each face gets its unique URL. Then we can use them elsewhere on the Internet. 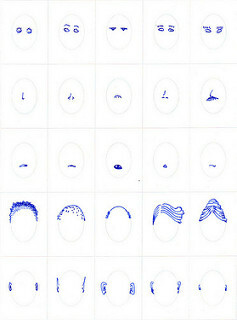 We can also generate a gallery of many faces. It’ll be easy. If we really want to, we could also move the entire library of elements to SVG and have SVG output. This would allow us to print the faces without pixelating it all. We’ll work it out. We’ll work it all out. Dimensions, number of colors, number of elements, and so on. All you need to do is get in touch. Here’s what it would look like if we integrated it into the Character Sheet Generator. The discussion that prompted it all is on Google+. My own efforts have to be seen in the context of Character Generator with Random Pictures, the MOAM Avatar Generator, going back to my efforts using Flashface in 2012. The app is available online if you have Flash enabled or as an app for both Android and iOS. Ok, hm, perl. As I understood the code, the parts are put on top of another after specifying white as transparent, as you said. I think you could get a lot more out of it if you would randomize the height of the parts just a bit. As I don’t know perl... maybe it would be possible to put the parts into a special container (Huh, Javaism...) or just a specified part of the image and just move this up and down (and sideways for half-orcs? ;) ) or even scale them up and down. This would make a lot more use out of fewer graphics. Just my 2 Cents. tintenblau.png is a tiny image with a pixel for each color allowed. All of them are shades of blue. This makes it really easy to get rid of shadows and smudges. The new files are created in the “elements” subdirectory and numbered automatically. The code is still missing some sort of clean-up, but it’s a start. 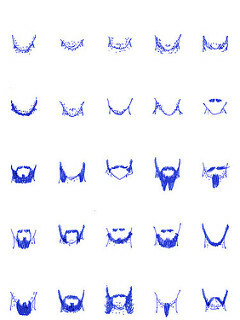 New release allows filtering such that you can have various types for each element – the obvious elements for me is beards vs chins for men and women, same thing for fancy hair vs bald heads. Also, pointy ears for elves. Added hairdos for women, added eyes, added beards for men... Now I’m noticing that there is very little leeway for mouth positioning. 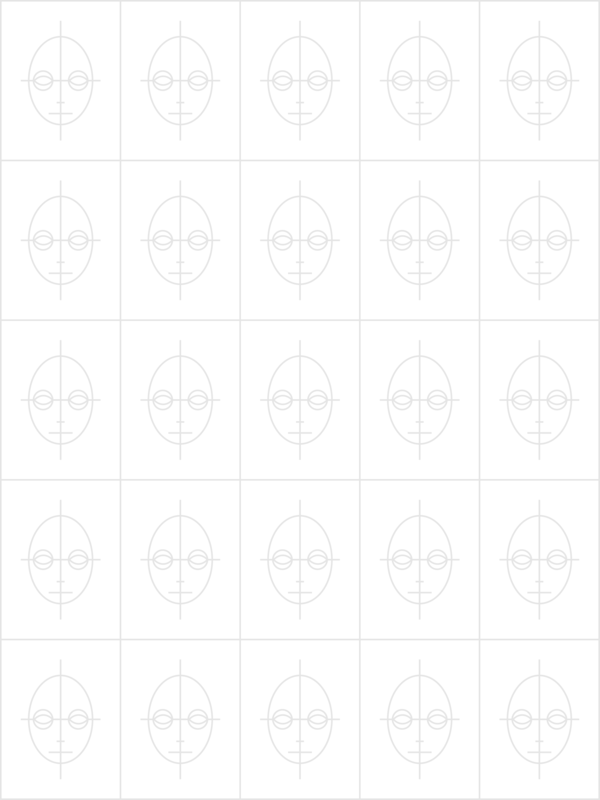 I should have added more reference lines to my empty.svg file. The result is available from the elements folder.